32 | TH E M R EP O RT treliantsolutions.com to and Assuring Compliance through the Combined Power of Technology and Expertise brings you: Treliant Solutions® provides soware to reinvent compliance as a source of competitive advantage for financial services firms. By marrying best-in-class technologies with deep subject matter expertise, we empower lenders to manage risk and gain key business insights while meeting and exceeding regulatory compliance expectations. 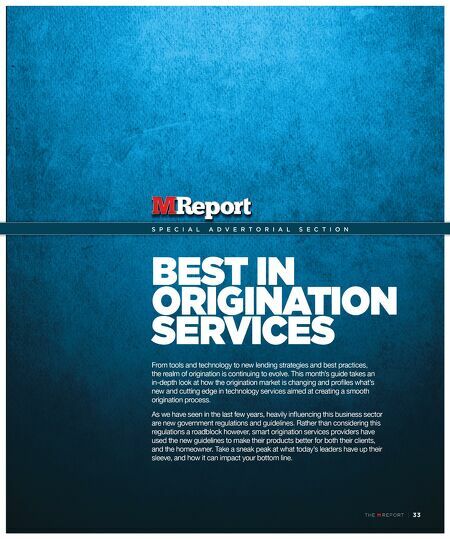 Our solutions also include: • MRG Document Solutions: Dynamic technology to deliver compliant mortgage documents • BoardEffect: Easy-to-use soware for managing boards A browser-based suite for excellence in Fair Lending, HMDA, and CRA compliance • Enables accuracy, ease, and confidence of data input • Generates fair lending insights and business intelligence from any lending portfolio—mortgage, credit card, auto, student loans, and more • Includes flexible licensing terms—no seat restrictions "RiskExec® was designed to strike a balance between analytical power and ease of use. Many of the statistical models needed for fair lending analysis are included, with designs streamlined to meet the specific needs and pressures of people working in financial services." —Dr. Anurag Agarwal, President, RiskExec Division Treliant Solutions A file review application for "Know Before You Owe" compliance and quality assurance • Identifies highest-risk loans, evaluates compliance, and calculates any remediation • Provides multi-level workflow, management reporting, and root cause analysis to form a full TRID Compliance Management Program "True 'Know Before You Owe' compliance can only be fully achieved by marrying deep expertise with cutting-edge, process-enabling technology." —Shelley Metz-Galloway, Managing Director, Treliant Risk Advisors Reinventing compliance for competitive advantage. 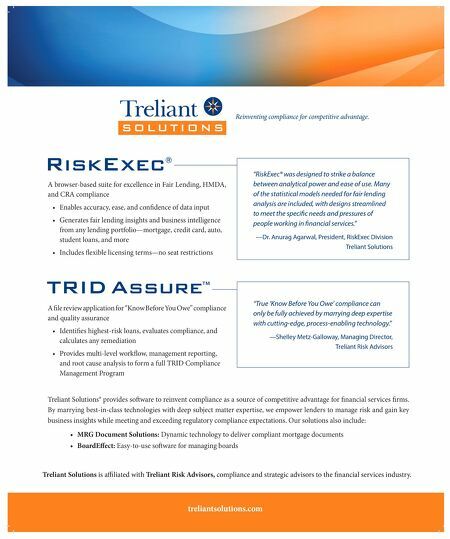 Treliant Solutions is affiliated with Treliant Risk Advisors, compliance and strategic advisors to the financial services industry.